Top rated gift in 2019! Rose Bear with Love sends a message of everlasting love to your significant other! Available in various colors with a cute little heart in the bear's embrace. Also available in "Bear with Crown" option for your little princesses and children or mama bear! Best gift for Anniversaries, Valentine's Day, Weddings, Birthdays or any occasion that warrants such a unique and precious gift. 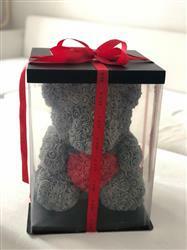 Custom-made rose bear will last a lifetime with no care needed! Handmade styrofoam bear covered in faux roses. Step your game up this Valentine's Day and impress the lady you love with a gift made of roses 🌹that will last forever! Rose Bear with Love is a gorgeous decorative teddy bear made of soft synthetic roses in romantic colors that'll will look great as a decoration piece in your loved one's home or office. Thank you. Great customer service and great product. Got it for my SO for her birthday. Managed to impress her with it so that's saying something. Bear got here much faster than I expected! This is an amazing bear. It's all very well packed and came all in one piece. I love it! !